Global cache contains data that is no longer needed. This situation may occur, for example, if you have processed VMs running one OS and do not plan to process VMs with such OS in future. The global cache will contain data blocks that may be of no use for VMs running other OS. In such cases, it is recommended that you clear the global cache and populate it anew before you start remote jobs processing new types of VMs. In the inventory pane, click WAN Accelerators. In the working area, right-click the target WAN accelerator and select Clear cache. Before you clear the global cache, make sure that you do not have any running jobs that use this target WAN accelerator. 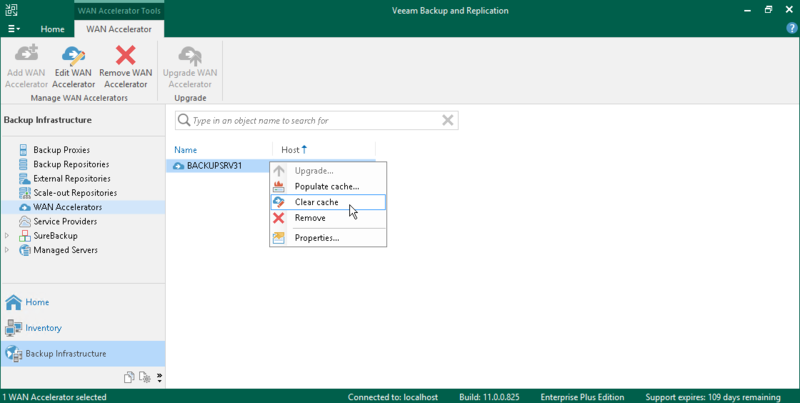 When the global cache is cleared, Veeam Backup & Replication will restart the Veeam WAN Accelerator Service, and running jobs will complete with the Failed status.